Do you often feel stressed out? You’re not alone. While there are many factors that can contribute to stress becoming a chronic problem, work is the main source of stress for Americans. According to the American Institute of Stress, 80 percent of workers feel stressed on the job. Nearly half say they need help learning how to manage their stress levels. 42 percent of workers believe that their coworkers could also use help managing stress. Stress originally evolved as a survival mechanism that was meant to protect us and help us escape danger. Although that’s still important, in our modern world stress can clearly become a detriment to our health and overall feeling of well-being. Chronic stress has a direct effect on our bodies and our brains. One study even found that it was the basic cause of 60 percent of all illnesses and diseases and increased the risk of heart disease, heart attack and stroke. Luckily, stress reduction techniques are easy to learn and most can be done anywhere, anytime. Many of these can even be done at work! 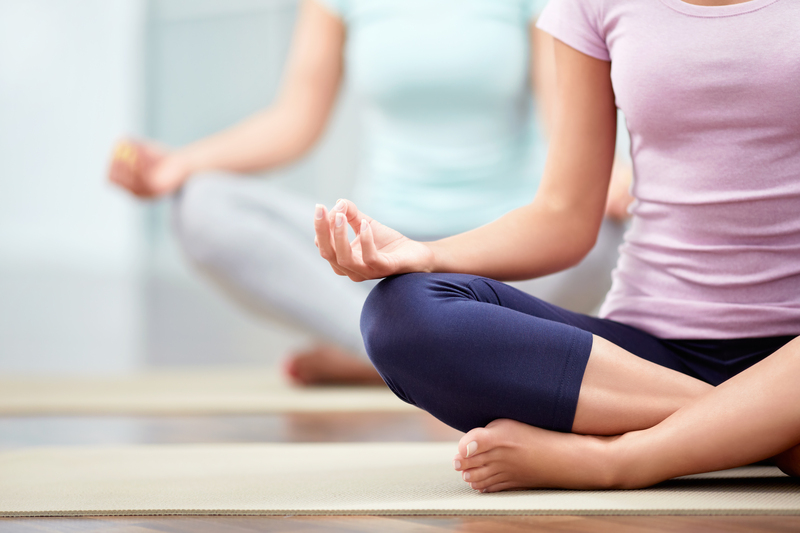 Practicing yoga combats stress while keeping you active. By combining physical movement with breathing awareness, yoga has been shown in multiple studies to reduce stress, improve mood and increase subjective feelings of wellness. In other words, it makes you feel happier! Yoga’s increasing popularity means classes are more readily available in many areas; it’s also easy to do on your own at home. Once you are comfortable with some of the poses, you might even be able to fit in a few easy stretches during lunch if you want a quick dose of stress relief at work. Meditation is the art of focusing your mind and relaxing your body by combining breathing techniques and situational awareness. Meditation has been proven to have profound positive effects on the mind and the body. While it may seem intimidating initially, the only way you can fail at meditation is by not doing it. If you want a little guidance through the process, there are many resources for quick and easy meditation techniques available online. Some smartphone apps even offer quick and easy two minute assisted meditation sessions that could be penciled in during a break at work! Any type of cardiovascular exercise is great for counteracting stress. Exercise can take your mind off of your worries, and raising your heart rate through exercise releases endorphins, the “feel-good” hormones, and enhances your sense of well-being. One of the easiest ways to get your cardio in for the day is simply going for a 20-minute walk. Even better, bring a friend—social engagement is a proven stress reliever. Achieve this goal during the workday by proposing walking meetings or taking a short lunch walk with your favorite co-workers. In order to curtail the negative effects of stress on your mind and body, you need to be able to recognize your own unique stress reactions and intervene using stress relieving techniques as soon as possible. Stress is a reality of modern life that seems to be here to stay. Life is going to throw stress your way; it’s how you deal with it that will make the difference in your life and your health.